You’re not wrong. But you’re also not entirely right. When thinking about improving the usability of Business Intelligence (BI) and analytics software, you might automatically think about a seamless User Interface (UI), that lets business users intuitively browse, explore and share reports, dashboards and other BI content with a few simple clicks. And it’s true. This is important. But what about the content creation and administration phases? 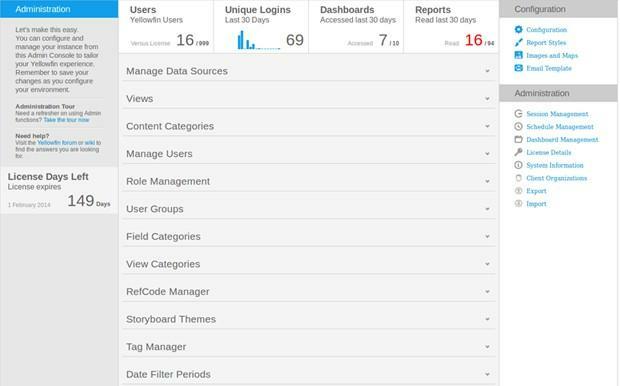 What about building reports and dashboards or managing views and source connections? These processes – whether designed for power or business users – should also be an effortless and intuitive user experience. 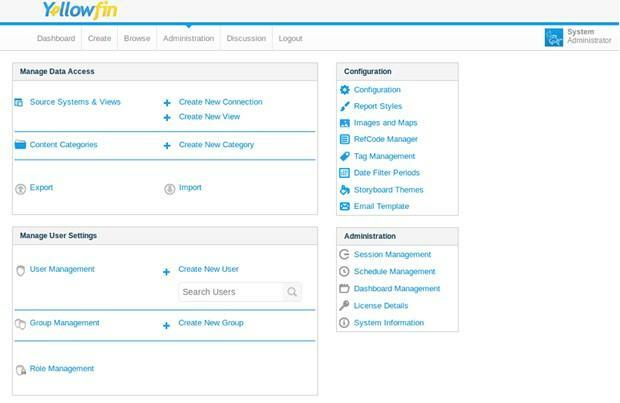 With the next release getting closer, everyone at Yellowfin is working hard to provide our users with the best administrative experience possible. As is the case with every release, we intend to stay true to our values; in particular, we want to keep making things easy for our users, which is why we’ve completely redesigned the administration page. Get rid of the static! In previous versions, the administration page mainly consisted of a list of links, which pointed to the different administrative sections. Content was static, and there was limited page functionality. This was, so to speak, just a proxy to Yellowfin’s other administration components. Therefore, unfortunately, the older admin page provided an indirect and somewhat cumbersome experience for the system administrator. While our possibilities were limited by the available technologies at the time it was developed, there’s definitely a better way to do it today. It may sound like a largely cosmetic change, but there’s actually more happening behind the scenes. Communication with the server-side is achieved via Ajax calls. Of course, server-side changes are also involved. Whilst our Web services API does not yet allow us to rely exclusively on it for communication with the Web client, we are laying out the foundations for a future where this will be possible.